Even before voters in St. Louis County overwhelmingly approved a smoking ban last week, opponents of the ban warned that they might challenge the statute in court. At a press conference in October, Bill Hannegan of "Vote No on Proposition N" and Keep St. Louis Free said he and others were examining the constitutionality of the ban. While opposed to any law prohibiting smoking, they argue that the the county ordinance is particularly unfair because it exempts casinos and bars that derive 75 percent of their revenue from alcohol sales. Under this argument, smoking advocates say businesses exempted from the ordinance would unjustly draw patrons away from establishments (such as restaurants and bowling alleys) that must abide by the ban. "There's reason to believe that such exclusions would be illegal under the law," said Hannegan back in October. A day after last Tuesday's vote in St. Louis County (which also triggered a somewhat similar smoking ban in St. Louis City) Hannegan was quoted in the Nov. 5 Post-Dispatch saying much the same thing. Bill Hannegan, an activist against both smoking bans, said opponents met Wednesday with lawyers to discuss ways to overturn them. He called the county ban unconstitutional "special-interest" legislation that favors casinos. So how 'bout it? Is the county smoking ban unconstitutional? Or is Hannegan and other anti-ban folks just blowing smoke? Daily RFT recently discussed the county's smoking ban with three area experts on constitutional law. Their consensus? A legal challenge to the ban has as rosy a prognosis as a stage-three emphysema patient. That is, it ain't looking good. 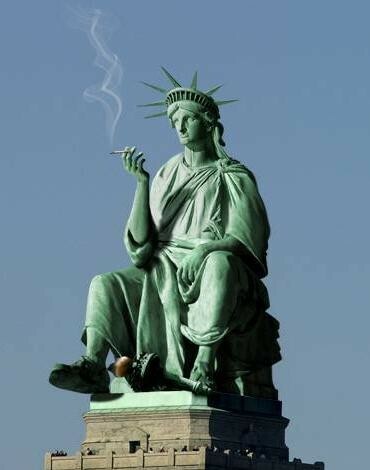 Any constitutional challenge to the smoking ban would almost certainly deal with the Fourteenth Amendment and particularly its "equal protection clause" that all citizens be treated equally under the law. But as Washington University law professor Greg Magarian notes, the courts have by-and-large ruled that equal protection only applies to individuals and not businesses. "The only way equal protection really works is if you can demonstrate that you are member of a suspect class, such as race or gender discrimination," says Magarian. "The notion that one kind of company can say I'm being regulated differently from another company and that's unfair has been strongly repudiated for decades without contradiction. There's just nothing there." Magarian points out two separate Supreme Court cases in the mid-1900s (Railway Express Agency v. New York and Williamson v. Lee Optical) in which justices upheld that the Fourteenth Amendment had little bearing on businesses. "There's no question that the (county's smoking ban) referendum treats certain companies and entities differently under law," posits Magarian. "And it's entirely plausible to say it's unfair, but it's not plausible to say its unconstitutional at least as it would pertain to the federal Constitution." Brad Ketcher, a St. Louis attorney who specializes in constitutional ballot measures, says the Missouri Constitution would also make a legal challenge difficult. "Missouri law prohibits what are called "closed in" classifications," says Ketcher. "For example, if the ban stated that it would exempt a bar at 33 W. 8th Street but not the bar right next door. But in the case of the county smoking ban, the classifications are not geographic nor do they single out a certain business." Adds Ketcher: "It's difficult to see cigarette smoking as a protected activity. It's not about race, or voting or reproductive rights -- or things you think of as fundamental to your day-to-day being as applied to the Constitution. And the courts probably wouldn't see you smoking as fundamental right to a free society." What could make the county smoking ban even more difficult to overturn, says Wash U. 's Magarian, is that it was voted in by the people. "On the federal level, courts have been more reluctant to second guess measures passed by voters compared to those approved by public officials. Why? Because part of any equal protection inquiry is to look at motive. Was this deliberate discrimination? Proving motive with just a relatively few legislators can be difficult. And it's a nearly impossible task when considering tens of thousands of voters. Still, there might be a slim chance of the law being overturned. Doug Abrams, a professor of law at the University of Missouri, agrees that a constitutional challenge to the ban would be difficult. But he notes that referenda have been overturned before, most notably in 1996, when the Supreme Court struck down a Colorado law -- voted in by 53 percent of the electorate -- that excluded homosexuals from civil rights protections. "In that case you had an obvious suspect class singled out due to their sexual orientation," says Abrams. But as far as the smoking ban? "From what I understand of that argument -- without a lawsuit being filed at this time -- I don't see a federal equal-protection issue prevailing. Economic regulation gets almost no scrutiny from the court in regards to the Fourteenth Amendment."